Saisei in Japanese means rebirth-recovery. This was exactly what Giorgia Palmirani had in mind when in her Bologna workshop started this new and unexpected accessories brand. Old unused kits, scraps of historical workshops, old materials, military tents and army fabrics carrying the signs and taste of the time, yet carrying their glorious, never lost story. 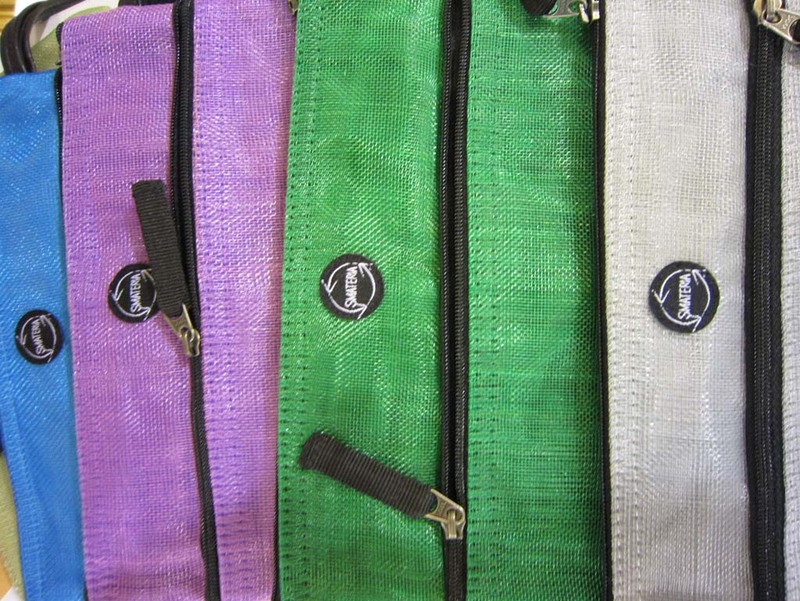 All this is turned into comfortable large and stylish handcrafted bags. 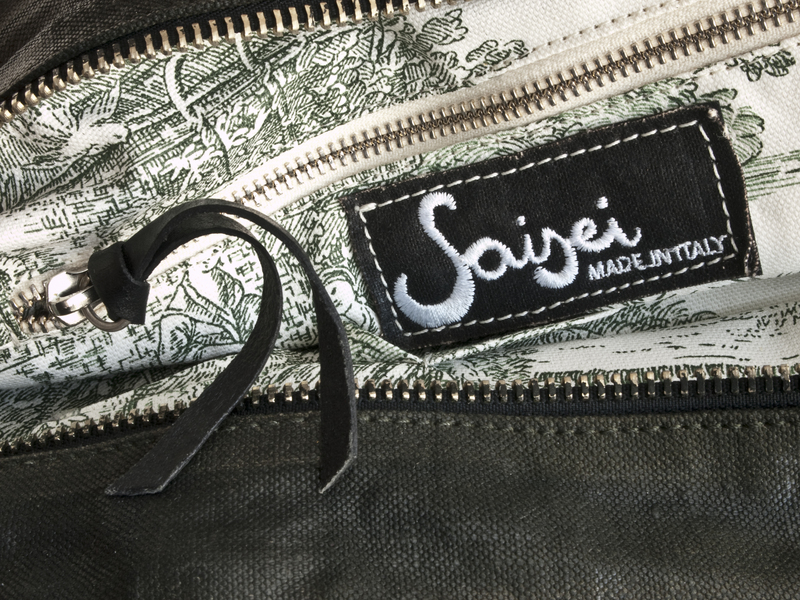 At White in Milan and Tranoï in Paris Saisei is presenting the new fall/winter 2012/13 collection. Mash – Assembled selecting the essential parts of old Italian army tents (including: writings, studs, etc….) 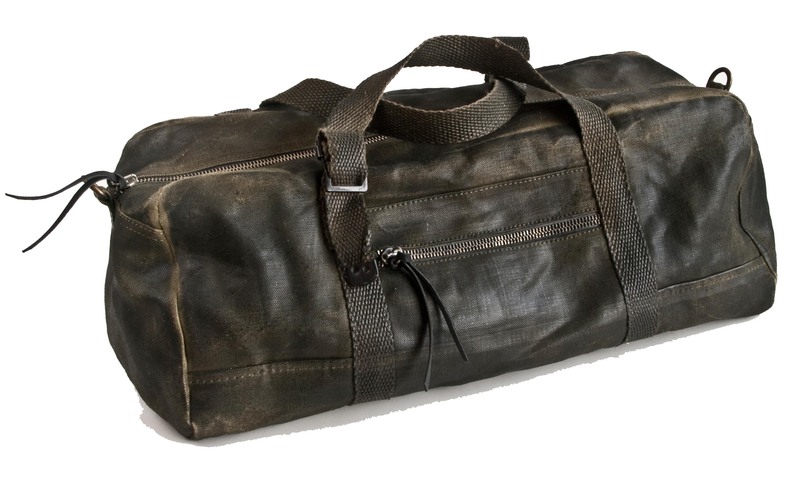 once finely manufactured, all bags undergo the exclusive in capo waxing and colouring processing, to reach their final and unique look yet clearly showing the original features of the fabric. 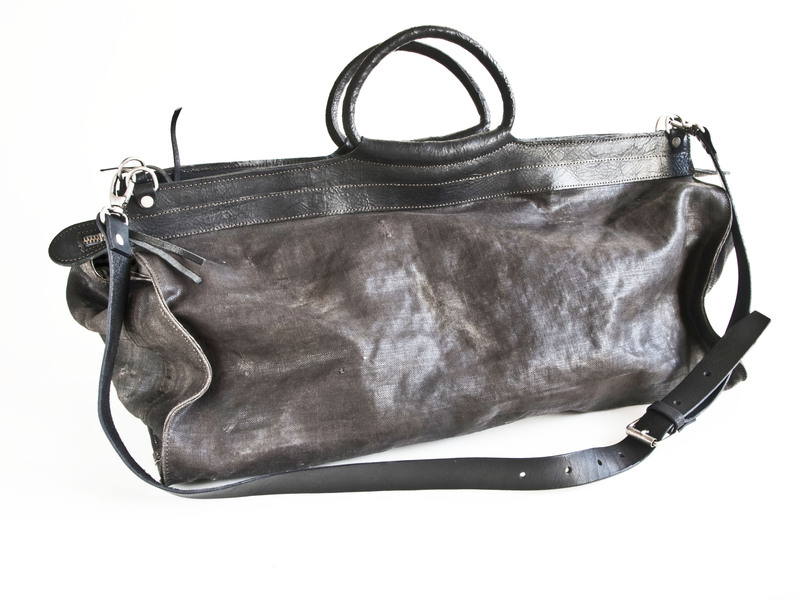 Vespucci – Here the material is the hemp fabric recovered from the Vespucci school ship old sails,then dyed and waxed through the same exclusive process. Paint – the same hemp fabric is hand painted with strokes of acrylic paint and then also finished with wax. Simple shapes for big-size bags a sort of container for all past and present stories, where continuity and and history find their common thread. 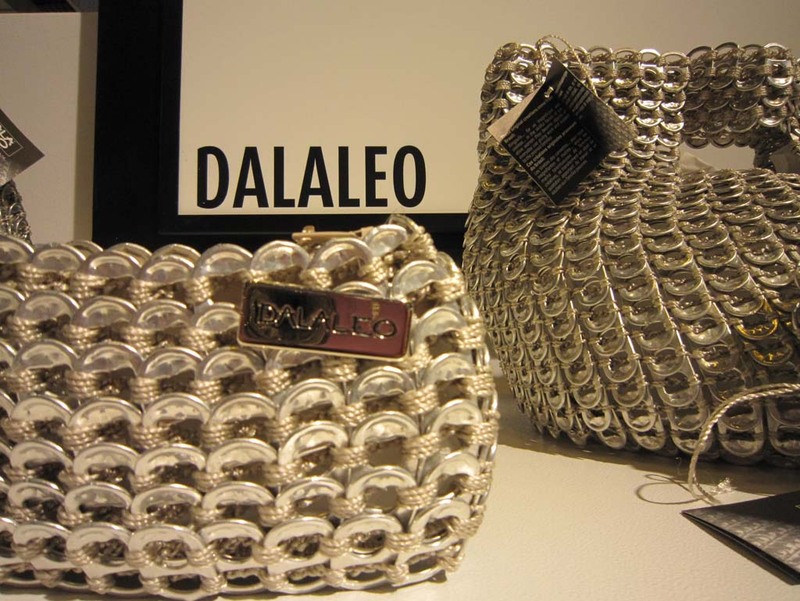 Sometimes beautiful projects and products are the result of an intuition, a coincidence and a chance. This is probably the case of Smateria. When Elisa and Jennifer, both from Italy, met in Cambodia they had no business plan nor product development schedule, just good will and a vision: helping local women earning their living through their work. 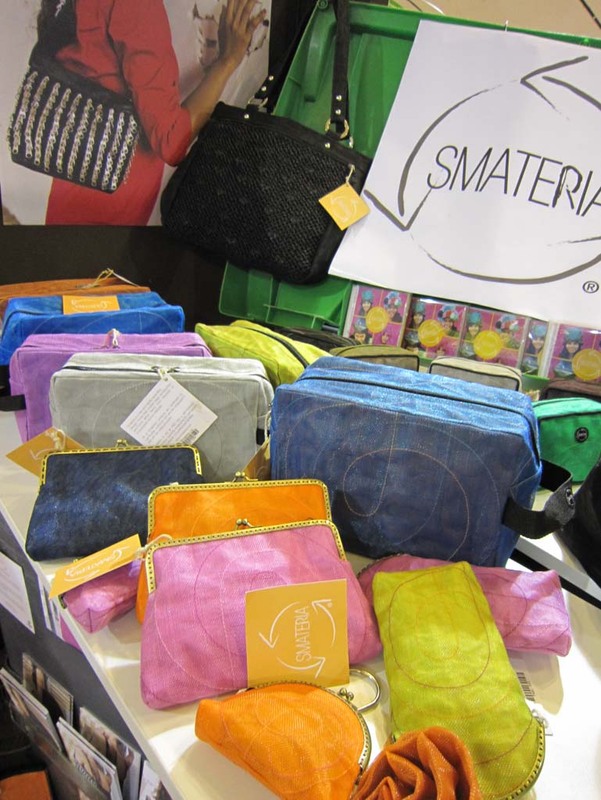 Smateria was in Paris at Ethical Fashion Show to present their new collection of fashion accessories made with fishing nets, mosquitoes nets, recycled motorbike seats and crocheted plastic bags. 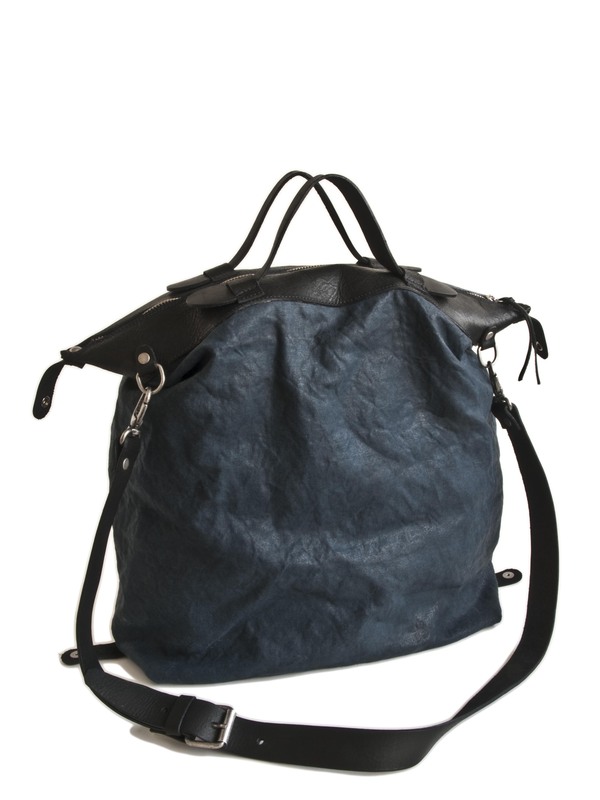 A wide range of bags for men and women, beautiful and strong travel accessories including the best seller weekender bag. Everything started in 2005 from few unique pieces created by Elisa with recycled materials and Jennifer asking if she thought about selling all those beautiful things. From the obvious answer “no” to the creation of Smateria, the step was quick. It was not easy to crate from scratch a recycled material supply chain. Work organization and exports knowledge needed to be built in order to cope with large orders that immediately arrived. Now more then 50 people are regularly involved in production and exports, products are sold worldwide and – yesterday news – they just opened a daycare center for employee’s kids in their premises.This shows how good products and good will can really make the difference and give a chance for a better life to artisans and their families. The New Face of the Paris Fashion Shows without SoEthic! Only a week after the official closure of Paris Fashion Shows, the british based online magazine Fashion United publishes what they consider “a clarification of the Paris offerings is required” now that all the shows held at Porte de Versailles are under the owner WSN Développement. Two major revolutions; the first concerns the dates of the shows that will move to January and June/July, coinciding with both Florence and Berlin Shows; the second is that the Eco-Ethical section named SoEthic, part of Prêt-à-porter Paris, will disappear. Far from being a sudden cold shower, most of the specialist exhibitors in the sustainable markets will welcome the idea of being “in the spotlight” and being 100% involved in fashion. In this regard, a fair number of leaders in the sector, such as Clémentine Nguyen, founder of the brand Sobosibio, refuse to be confined to the “eco-fanatic” label. 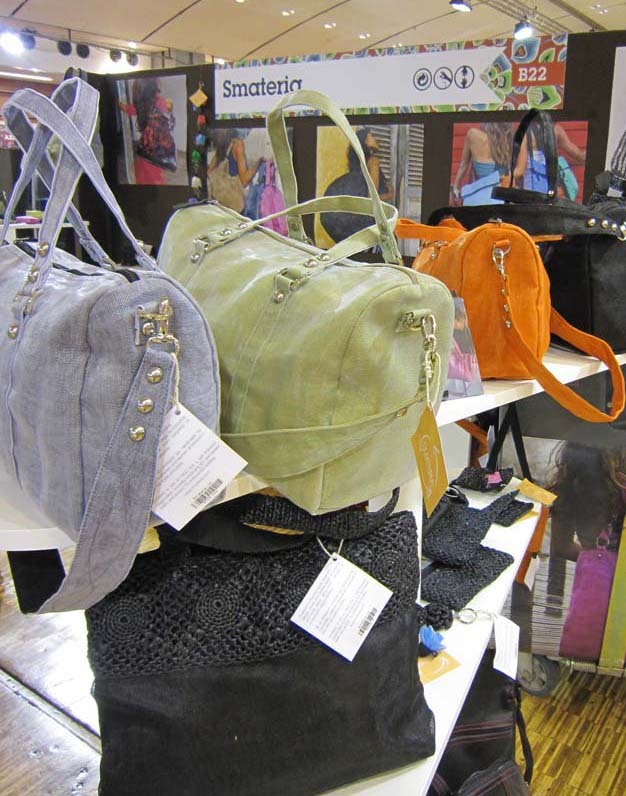 If Clémentine was not tempted to take a stand on the Ethical Fashion Show (Messe Frankfurt), held from 1 to 4 September at the Carrousel du Louvre, it is because the show is no longer “professional enough or to do with fashion”. On one side the “ghettoization” risk is high for sustainable fashion brands if consigned in small and wrongly timed shows, on the other it is not totally clear why to make coincide the Paris shows with the Berlin and Florence once. Many are the buyers and brands that would participate in all these shows each season. It is not necessarily a positive sign a monopolization of the market. To read the full article check Fashion United page. Paris, as in each season, confirms to be innovative and avantgarde and so sustainable fashion gains each season more and more a prominent position. This year Ethical Fashion Show moved to renown Carrousel du Louvre and from this time onwards will be seasonal and not annual. More the 100 brands and designers from all over the exhibited in a nice and cosy atmosphere, from kids fashion to accessories, from bijoux to women ware. 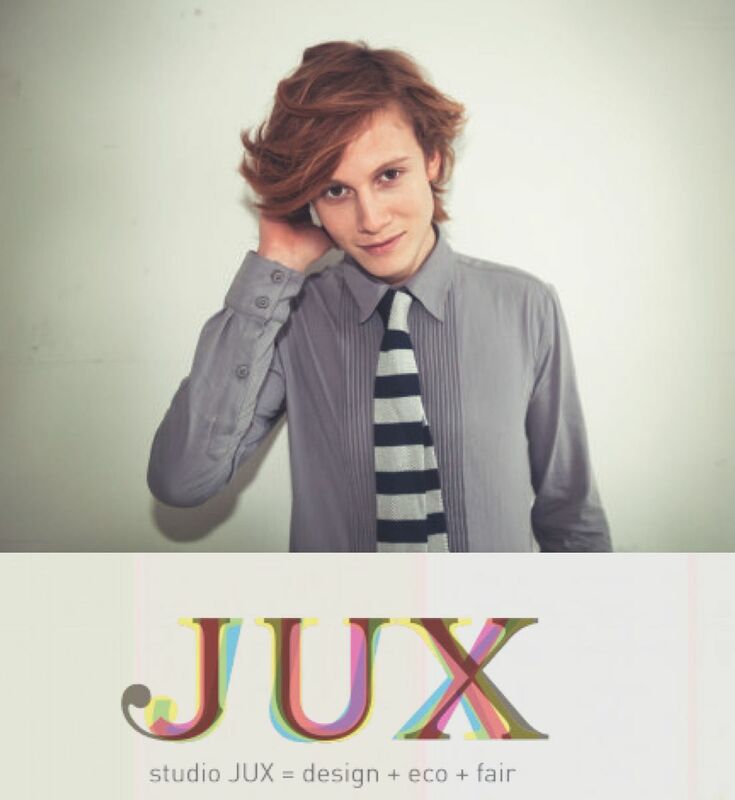 Beside the “usual suspects” who exhibit since years, like Jux, Trading For Development, Deux filles en fil, some new entries stood out for innovative design and materials. 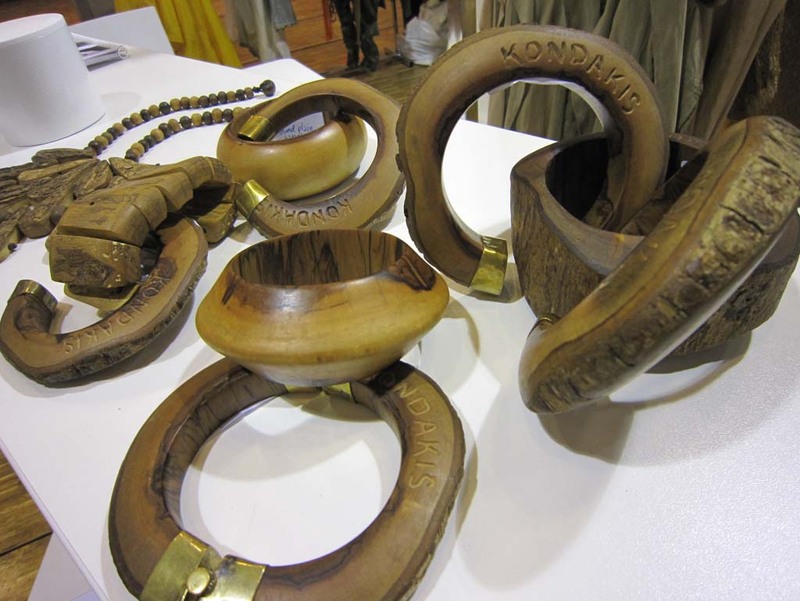 Kondakis, young designer based in Kenya presenting a range of clothes realized with parachute fabric or non mulberry silk dyed with vegetable colours with a complementary collection of fashion jewellery in “dead wood” (not cut but picked in the forest). 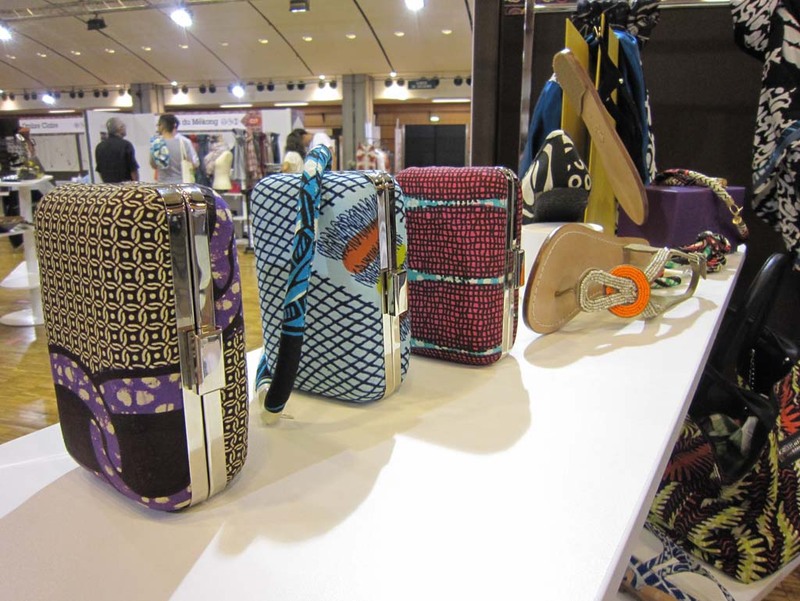 Doreen Mashika, a fashion accessories brand from Zanzibar where the use of traditional african wax textiles merges with an innovative and modern design. 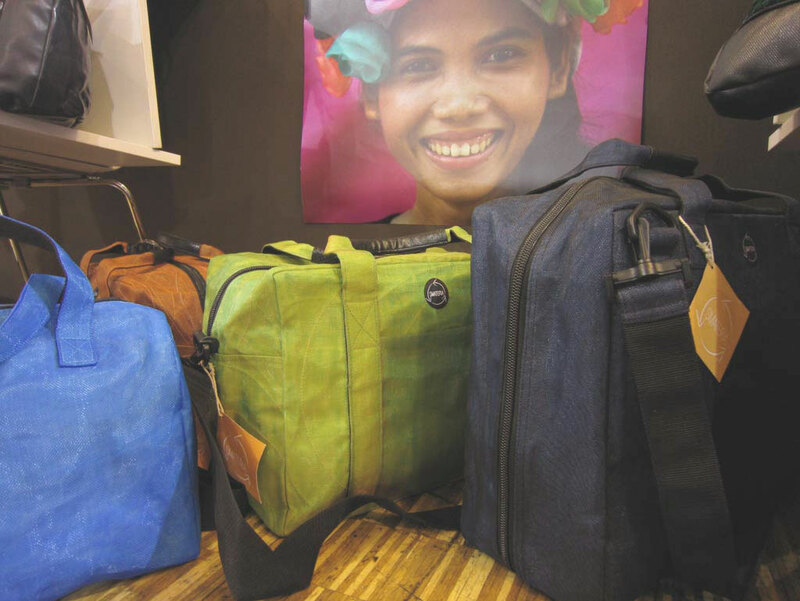 Smateria, if up-cycling is at its heights this Cambodian brand deserves a special place in it. 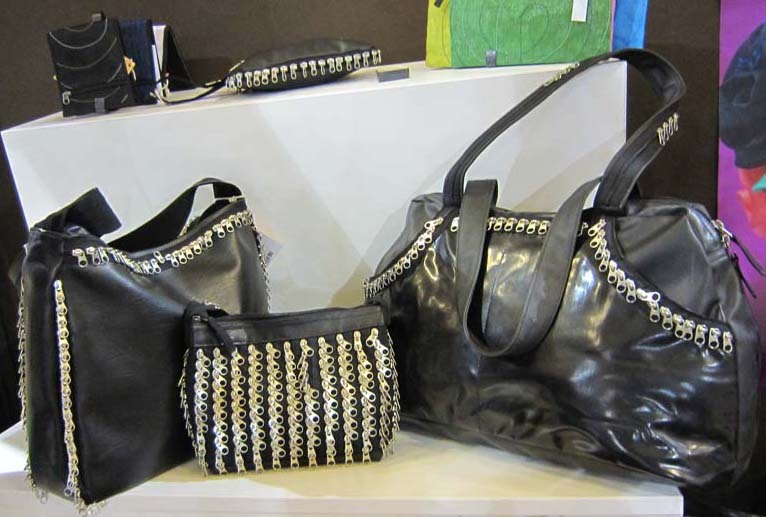 The use of fishing and mosquitoes nets, crocheted plastic bags and recycled motorbike seats to make bags and travel accessories gives to their collection a peculiar and charming look. In Port de Versailles, the official location of Paris pret a porter fairs, the section named So Ethic gathered more then 50 brands including Green Orange Collective where 22 Dutch designers presented their consciously produced creative fashion (among them Elementum by Daniela Pais , and Rianne De Witte), and a few interesting designers part of Now Showcase, a US based collective, extremely appealing the shoe designer Olsen Haus and the New York produced collections of Kelly Lane. Also the new trends pavilions of Who’s Next and Premiere Class were constellated of sustainable fashion brands, from the amazing Misericordia, to the very italian ones as Heidi Ritsch, Reale slow fashion and Dalaleo. 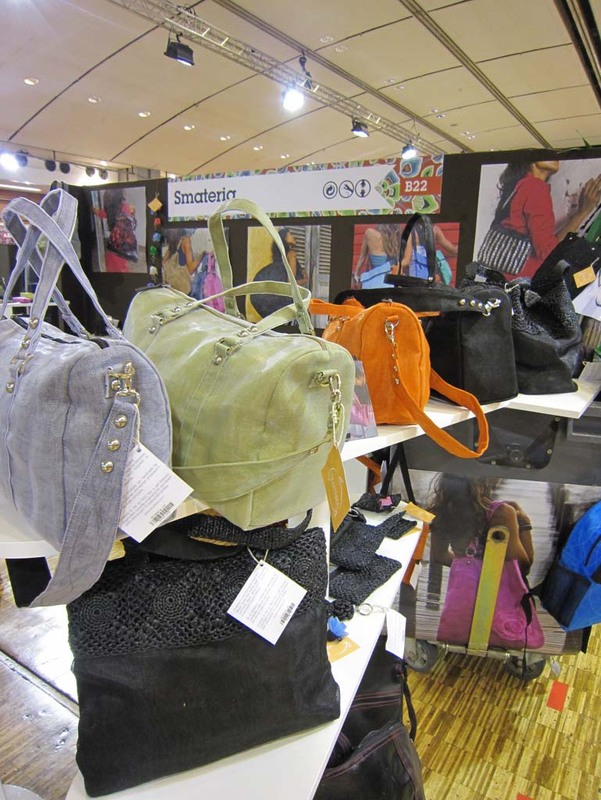 The growing presence of sustainable fashion brands in traditional fairs in an undoubtedly a positive sign so we ask to ourselves when will the Italian market start joining this wave with a successful fair dedicated to ethical fashion?